I’m a little behind on my posts because of the wrath of a nasty cold that finally freed me from its misery after 11 days. 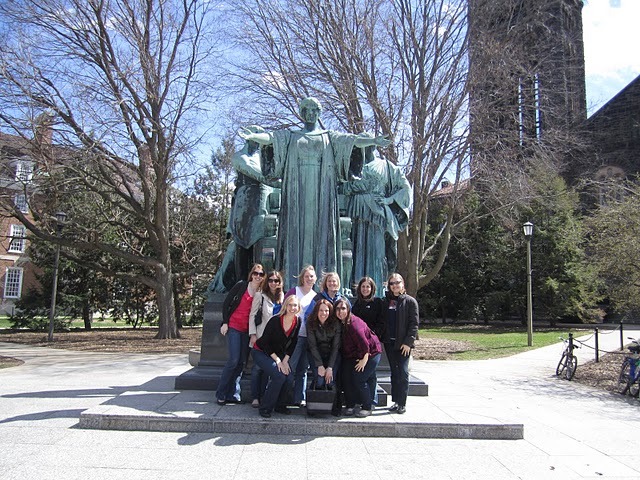 Even though I felt terrible over April 2-3, I still headed down to my alma mater – the University of Illinois. Here are some of my pledge sisters with me at the Alma Mater statue in the heart of campus town. 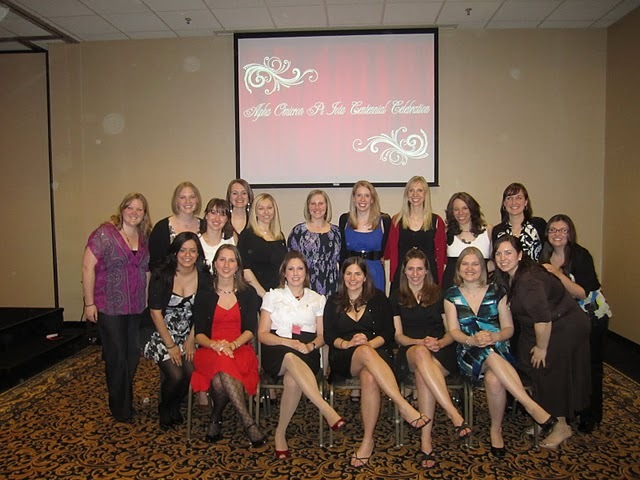 My sorority, Alpha Omicron Pi, hit a big milestone – 100 years on campus! To celebrate, my sorority planned a whole Centennial Weekend. Saturday morning, I headed down to campus with 3 of my closest pledge sisters. When we got there, one of the first things we saw was confirmation that our favorite campus-town restuarant, Za’s, was lost in a fire only a week or so before we arrived. Boo. We took a second to mourn, then headed down to the street to Murphy’s, a pub on campus. There, we waited until the rest of our group arrived, 9 of us in total. We had lunch together, then went straight to the Alpha Omicron Pi house, located in Urbana. Unfortunately, I didn’t get any photos of it from the weekend, but what a sight it was to see. The house was decked to the nines, and every surface in it gleamed with pride. The house was built in 1927, 16 years after our sorority was founded on campus. It’s been the AOII house ever since. It has undergone some major work since I lived there, and it shows. Walls were re-painted, new furniture was purchased, and our fountain was working once again! Gorgeous! I’ll skip ahead to the main event for the day – the Centennial Banquet. 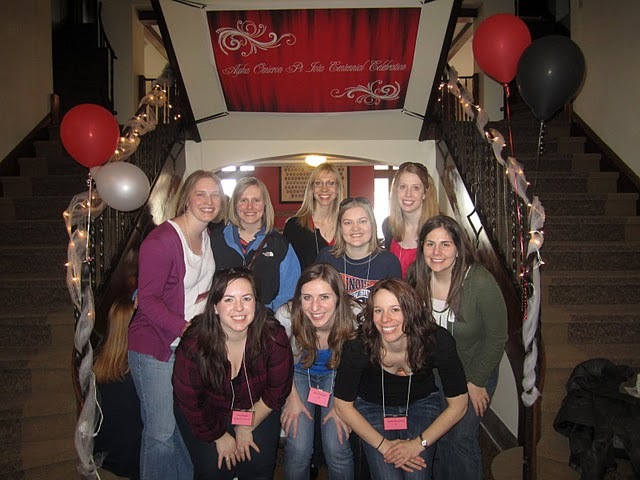 It was held at an off-campus hotel and over 300 of my fellow AOII women arrived for dinner, entertainment, and story-telling. Women came from pledge classes as far back as 1975, and we were graced with the presence of AOII’s current International President, Barb Zipperian, and a Past International President from the University of Illinois, Peg Crawford! 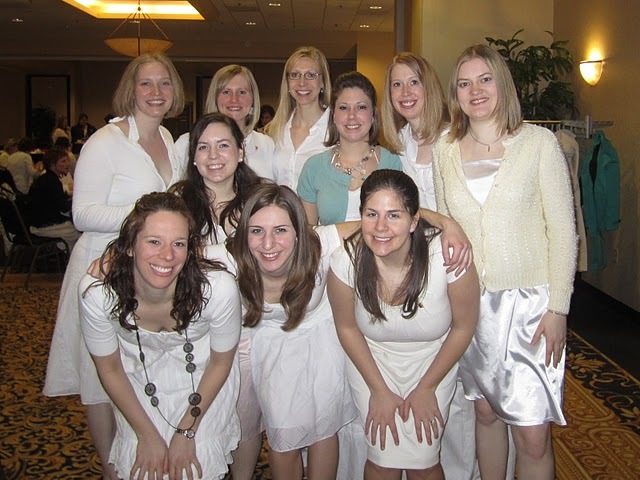 Here’s all the girls from my pledge class who attended Centennial. Look how fancy! The next day, a smaller group convened for the farewell brunch, where we said goodbye to the many sisters we hadn’t seen in quite some time. Dismiss the fact that we’re all wearing white. It’s tradition, but we all know how washed out we look. Overall, it was a fantastic weekend, and I’m so glad I went. I was more than a bit under the weather, but I knew I’d regret it if I stayed home. I went to U of I as a nervous 17 year old girl. On such a huge campus, I wasn’t sure I’d ever find where I belonged. I went through recruitment, and ended up at AOII. I honestly cannot imagine how my life would be without being friends with such strong, smart, beautiful, and amazing women. I don’t think I really noticed it until this past weekend, but these women helped shaped me into who I am today. And the best part? I still see about 9 of my sisters on a regular basis, but while back on campus and at the house, it was like no time at all had passed. Sitting and chatting on sofas in the living room, I stopped and thought this could have been a scene from many years ago, when all of us lived at 706 S. Mathews. It felt like home. I know, pumpkin is usually for pies and carving, both things in autumn. And it’s the beginning of spring. But don’t sell pumpkin short. 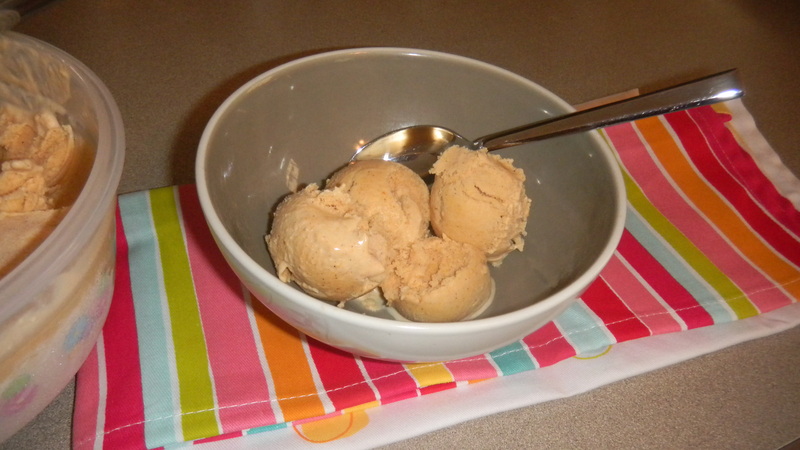 Canned pumpkin is available year-round, and if you have a husband that loves the taste of it, like I do, you can use pumpkin in a fun, unexpected way – to make ice cream! It’s not too difficult. This recipe does call for an ice cream maker though. It’s an item I’m glad I added to my registry, for all you brides-to-be out there. 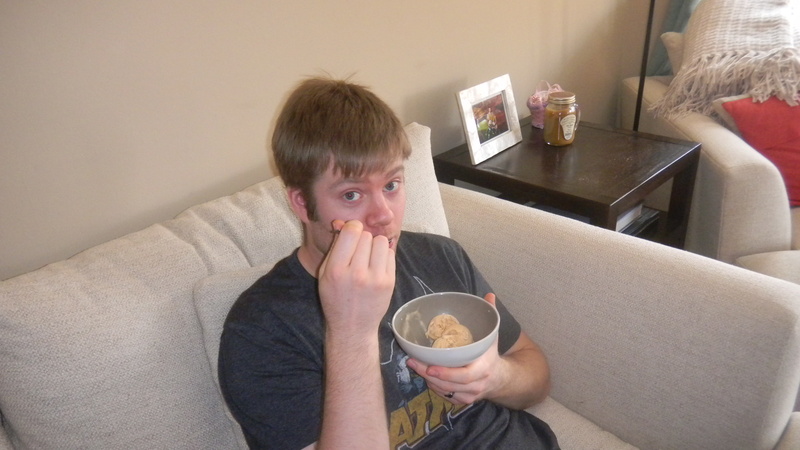 Note: you can substitute pumpkin pie spice for the cinnamon and ginger. 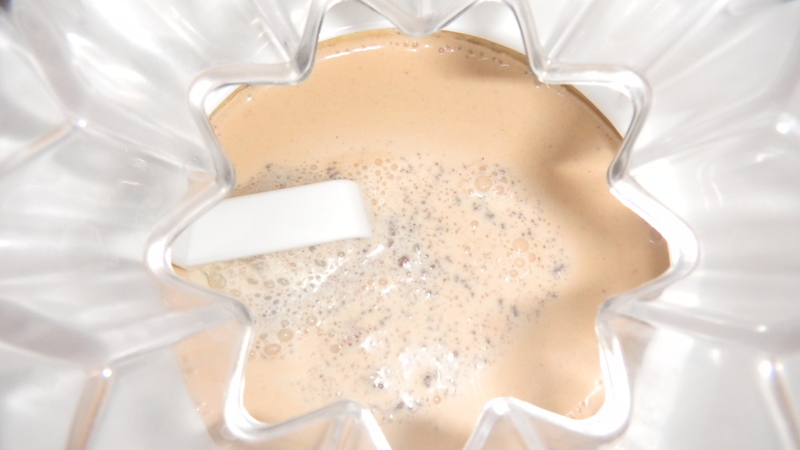 Put all ingredients into a blender. Pulse until mixture is smooth. 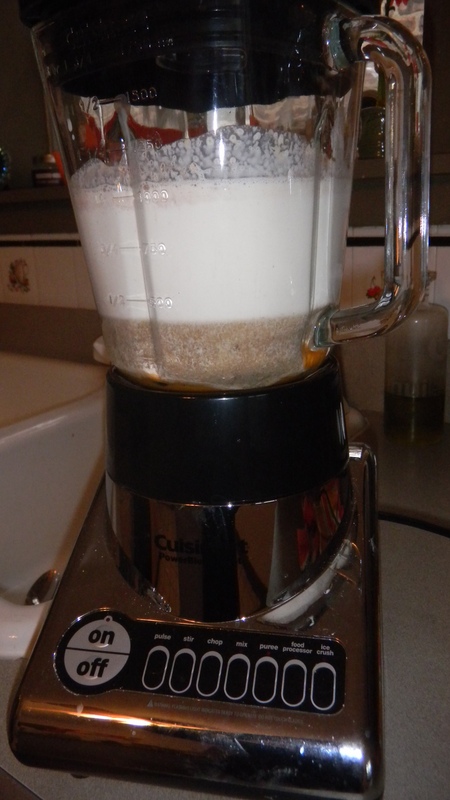 Then pour into your ice cream maker. 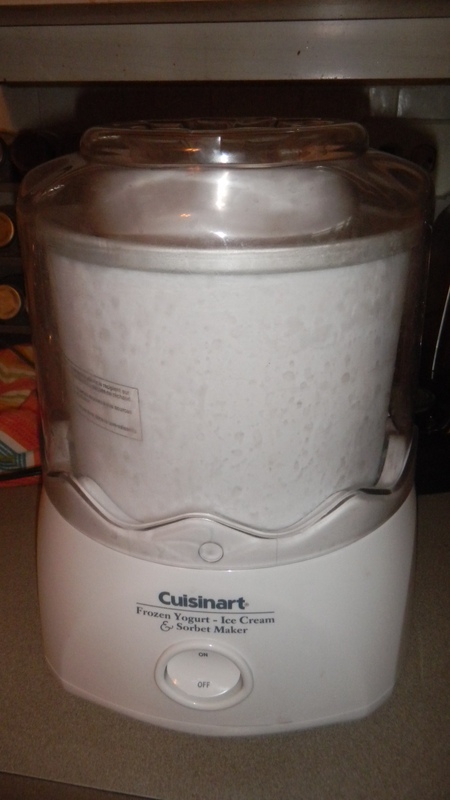 My ice cream maker is the Cuisinart 1.5 quart Ice Cream Machine. It’s a great product. Put the mixture inside the mixing tube, add the plastic churner, turn the machine on, and 20-30 minutes later, you have a tasty treat. The only complaint I have about the ice cream maker is that you can’t just make ice cream on the spur of the moment. The mixing tube must be in your freezer for 6-24 hours before you use it. In my experience, the longer you let the tube freeze, the more ice cream-like your ice cream will be. 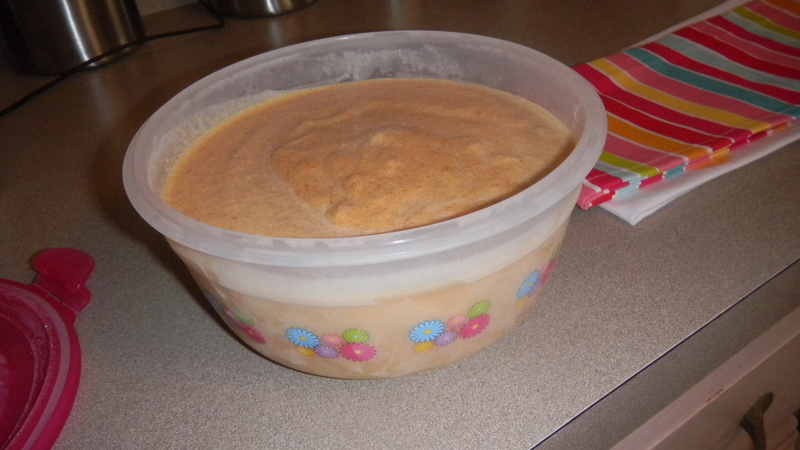 So, after mixing, I put the ice cream in a freezer safe container, and let it freeze even more. The next day, I took it out and served some to my honey. 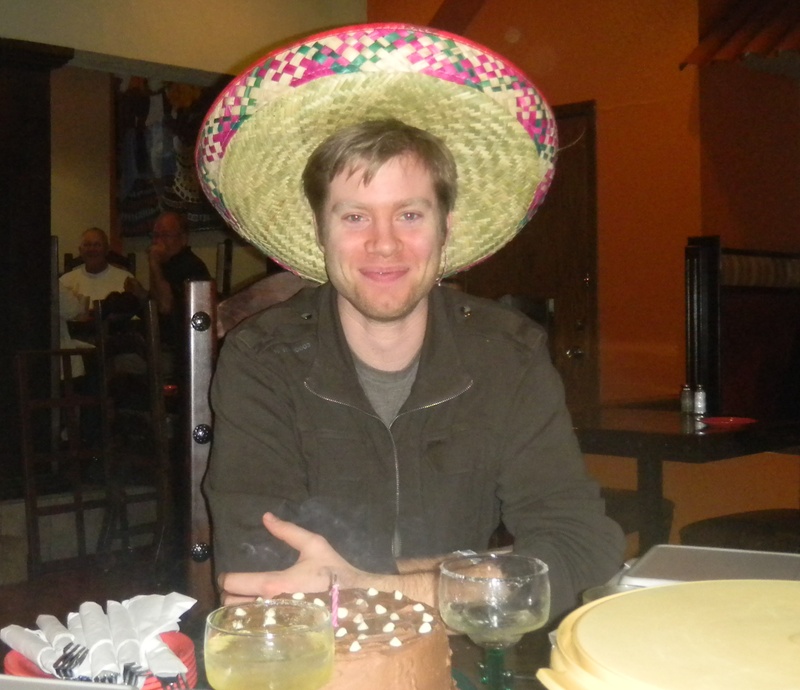 Happy birthday to my hubby! Happy 27th! The Bedroom Set is Complete! I’m very excited to say that in a couple weeks, we’ll have all the pieces of our bedroom set. Yay! Finding each piece has been quite a project. It all started with the main piece, the bed, which I immediately fell in love with after seeing it on Pottery Barn’s website. It’s the Valencia II Sleigh bed. I love the sleigh bed look, and this one is perfect in that it doesn’t have the bottom footboard part, as most sleigh beds too. I would have wanted one, but my 6 foot 5 inch husband put a stop to it, saying he wouldn’t be able to stretch out in bed with that extra foot board. And the dark mahogany color is oh so perfect. We ordered the bed online a couple weeks before the wedding, and it was delivered the day after we returned from our honeymoon. Love it! Of course, that meant we needed matching furniture. I had known this particular bed was the one we would get (we moved when we got married, so we waited to order it until we were at our new place so we didn’t have to move it), so I got a head start on craigslisting the matching pieces. Some said craigslisting matching pieces could not be done. How wrong they were! We scored both nightstands from one guy and this dresser from a family. Did we have to look for a while to find them? Yes. Did we have to drive all the way out to Geneva, IL to pick up the dresser? You bet. Did we save a ton of money? Heck yeah we did! That left the extra wide dresser that even now, a year later, I still couldn’t get my hands on from craigslist. Sure there have been close calls (one time, we were the third couple to respond to the ad, #2 got it! 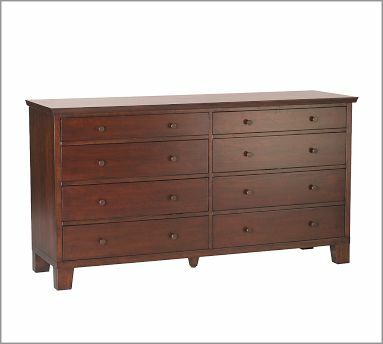 ), and we were even once going to buy the older version of this dresser in a honey colored stain and spend the weekend staining it mahogany ourselves, but we never got it. My wonderful parents have been quite impressed with my craigslisting abilities. They knew I’d been searching for that last piece forever. So, my mom called me one day and told me that she and my father would be buying the dresser for me and my husband for our anniversary, which is in 2 months! The reason she ordered it for us now? Pottery Barn is having a sale on some of their bedroom furniture. Thanks, Mom and Dad! I can’t wait for this baby to come home! I’ll post some bedroom pics, with my new dresser, when it arrives. 1. I like to DIY. 2. I like making our small-ish Chicago apartment feel home-y. 3. I love to save money. As you’ll see, our apartment was a doozy when we moved in. Some highlights: a sea foam-y green dining room, a spare room that has been a nursery and that retained its golden yellow stripes on a beige wall, and kitchen tiles that had images of fish and bottles of champagne on them. Oh yes, our work was cut out for us. Obviously, since we’re renters, not a lot could be done about those kitchen tiles. But luckily, we have cool landlords that let us paint until our hearts content (and we made some pretty bold choices). However, I’ll start off with an easy project we just recently did. This wall above the couch is the first thing you see when you walk through the door, so it needed some pizzaz. And some DIY. We bought 3 plain canvases on sale. The plan was to find a stencil and a paint color and then go to town. 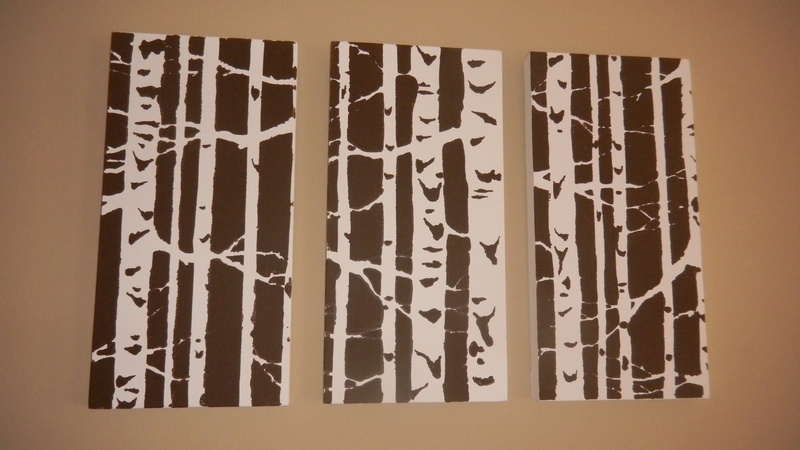 After much searching, we finally found what we were looking for – a birch forest stencil, from an etsy seller. The next decision was the paint color. We tossed around light blue and melon, both colors matching the rug and the couch pillows, but I thought that would be too much. Instead, we went with a deep brown color, Roasted Nuts, by Behr. 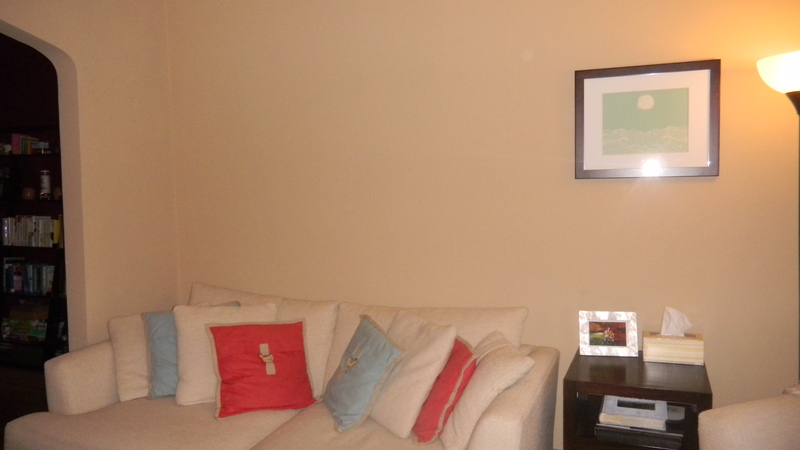 I liked the way the color plays off both the coffee table and the other piece of art we already have on the wall. Best of all, for a small job like this, we were able to get the small sample size of paint, for less than $3! OK, now for the how to do it. 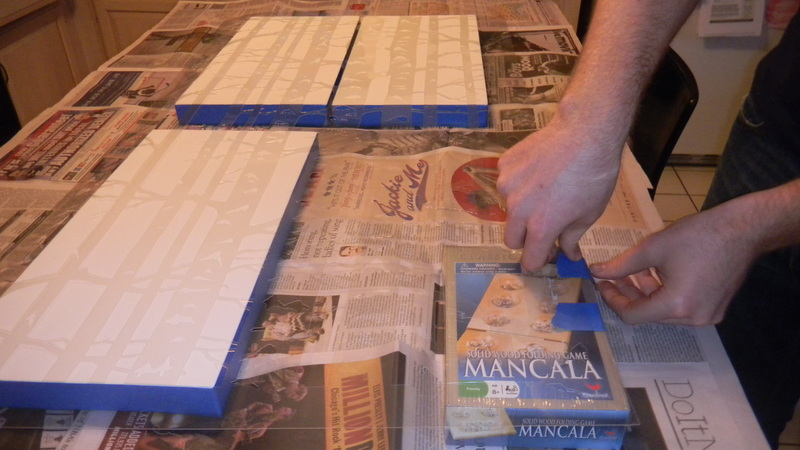 First, we used painter’s tape to tape off the sides of each canvas. Next, we set up our canvases on top of a bunch of newspaper. 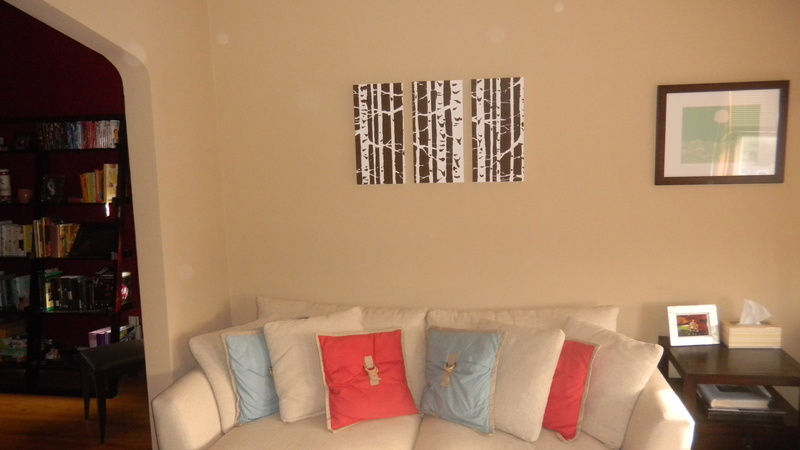 Then, we placed the stencil directly on top of all 3 canvases. Now, we were lucky in that our stencil was so large, but if yours is smaller, just do one canvas at a time. 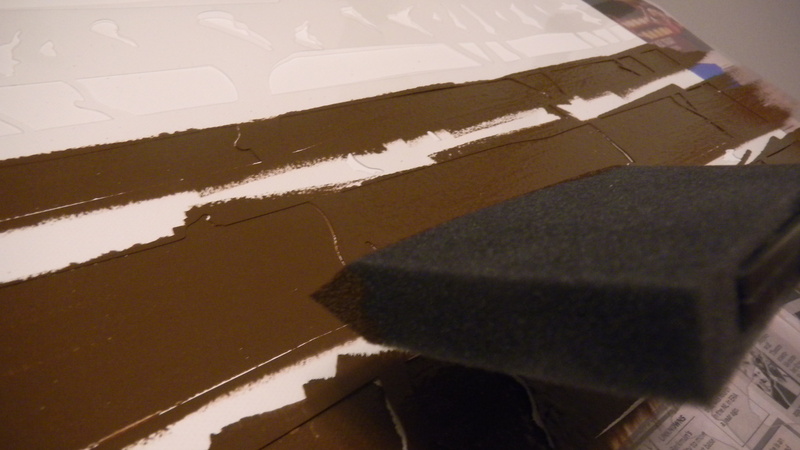 We secured the stencil to the canvases with painter’s tape on the side of the canvas. We also had a board game that was the exact hieght of the canvas, so we put that on the table too, so the stencil didn’t slump. 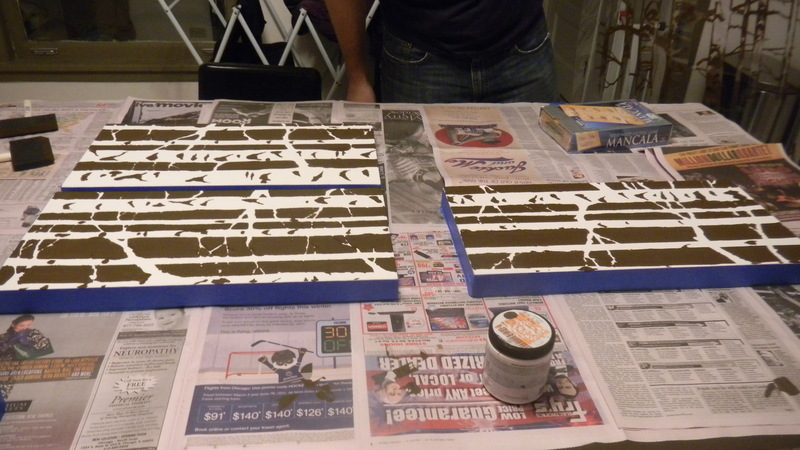 Later on, we found out we could have also used spray adhesive to stick the stencil directly onto the canvases. Oh well. It’s painting time! We got out our little dabber burshes and dab away we did. The key is to use a small amount of paint, so it doesn’t bleed underneath the stencil. Once we did all 3 stencils, we left the canvases there to dry overnight. The next day, we hung our new art above our couch. I love it.